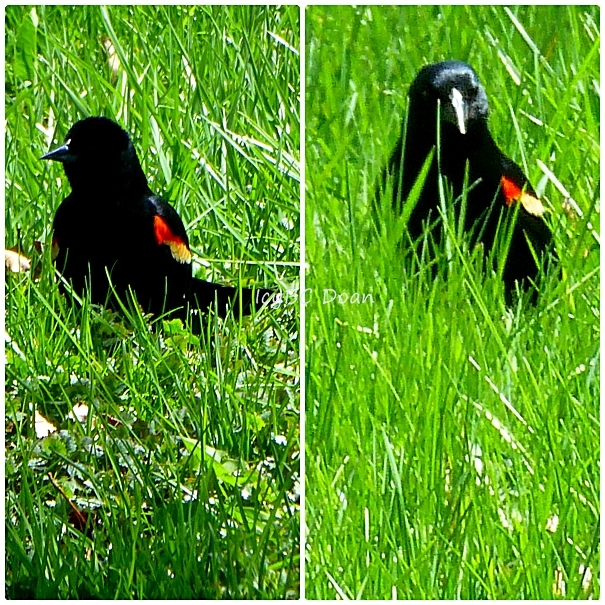 Redwinged blackbirds take resident in my neighborhood this year in great numbers. They are all over the place, but very hard to catch a photo. They are constantly on the move! This one was at my feeder, fighting with other birds for a chance to eat. The grackles seemed to be in control most of the time. Redwinged blackbirds and starlings tended to stay away from them. I am coming back for the sweet song. Great shots Icy. We have lots of them at our feeders too! i love these gents and their pretty ladies. I love redwinged blackbirds ... your shots are lovely. Happy Critter Day! They are a common sight in the summer months, I do enjoy they splash of colors and their sounds. Wonderful shots! It's a very handsome bird. Our Blackbirds aren't so colourful but always one of the earliest songsters every morning. They do have a distinctive, lovely song. One of my favorites. You got some nice shots. Such a nice bird! Lovely to see! This is a great looking bird! Those images are super!! I do love these birds...a lot!! Sorry I didn't get around to visiting yesterday...no power due to storms!! I like the way you caught him singing!